Since the upset victory of Republican Bob Turner (NY-9), pundits have argued over the meaning of the results. One of the more popular beliefs is that President Obama’s unpopularity played a large role in the election of a Republican in a Democratic district. Therefore, the reasoning goes, Obama will drag other Democrats to defeat in the 2012 House elections (because of a phenomenon known as negative coattails). Research by Alan Abramowitz (among others) illustrates that there is little to any evidence that special elections predict the results in the next general House election. The political environment can change from now until November 2012. But what if President Obama remains unpopular through 2012? Will Republicans actually gain seats in the House? The history of presidential year House elections suggests that while we do not know for sure, House Democrats probably will not fare well. It turns out that this coattail effect appears inconsistently in presidential year House elections. We all remember how President Bush’s negative standing three years ago (and Obama’s significant victory) helped Democrats gain 21 seats in the House. 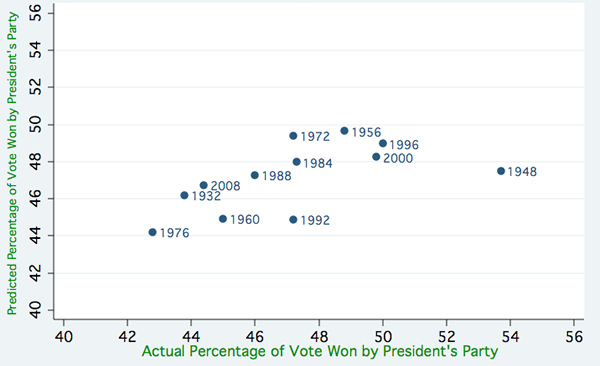 Some of us will also recall how Republicans made major gains during President Reagan’s landslide 1980 victory. But for every 1980, there is a 1988. President George H.W. 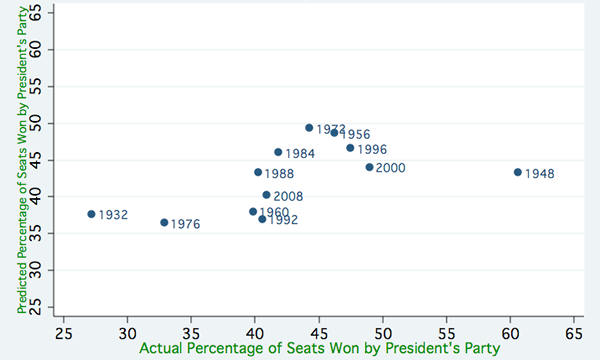 Bush triumphed in 1988, but House Republicans actually lost three seats. More recently in 1996, President Clinton cruised to an easy win, but Republicans lost only a handful of seats and retained control of the House. Is there a pattern to this inconsistency? When we break down the results of the last 20 (since 1932) presidential year House elections by whether the president’s party controlled the House, the coattail effect appears only in one type of House election: ones in which the president’s party controls the House. Let us take a look at a simple regression where the president’s party’s seats after the presidential year House election equals the number of seats they won in the prior midterm election plus the president’s party’s presidential vote in this election. This equation explains a whopping 98.3% of the variation in the percentage of House seats won by the president’s party in the eight House elections since 1932 in which the president’s party also controlled the House — in other words, when the president’s party holds the House, the total share of the vote the president and his party’s House candidates receive is very similar. Now, this statistical analysis relies on a small eight-sample set and cannot necessarily be used for future prediction, but it does indicate that this equation fits the data very well. 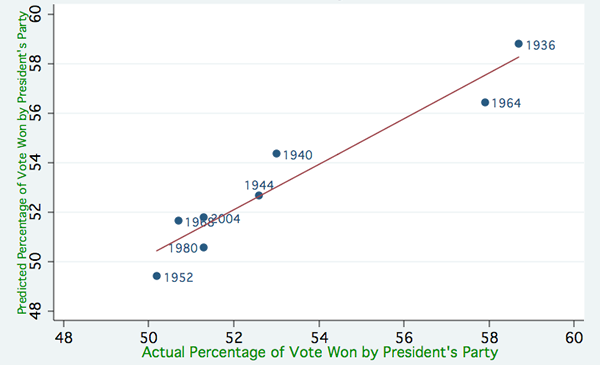 The coattail effect is also apparent when we look at the national House vote (i.e. actual percentage of ballots cast) for the president’s party. This time the regression is president’s party’s national House vote equals seats they won in the prior midterm election plus president’s vote in this election. As with seats’ regression, this equation accounts for a large percentage of the differences in the national House vote in the elections in which the same party controls both the speaker’s gavel and White House. The 2004 election in which the Republican Party won 51.2% of the two-party vote for President and 51.4% of the two-party vote for the House is a great example of this powerful relationship*. Why does this connection exist? To me, it is pretty clear. Whatever opinion the voters have on the direction of the country, they can reward or blame whichever party is in charge. With the same party in control of both the House and White House, voters know whom to hold responsible. On the other hand, the ability to determine the party accountable for the nation’s wellbeing, or lack thereof, becomes difficult when the speaker’s party and the president’s party differ. The past 10 months is a case in point. President Obama and House Republicans have continuously bickered over the budget, while the American economy continues to stagnate. Is President Obama at fault for putting forth plans that he knows have no chance of passing the House, or are House Republicans responsible for not being willing to compromise? This conundrum is borne out in prior election data. Let us re-examine the House seat formula above, but concentrate on the 12 elections since 1932 in which the president’s party did not control the House. We can only explain 15.5% of the differences in seats won by the president’s party in these 12 elections. The presidential vote variable is statistically significant at the .10 level, but holds little practical significance in forecasting seats. For instance, President Truman defeated Thomas Dewey by about 4.5% in 1948, while his Democratic party won an astounding 76 additional seats and regained control of the House. However, President Bush lost the 1992 presidential election by about 6%, but his Republican party actually gained 10 seats in the House. The House national vote formula seen above but applied to these 12 elections of divided government reveals a similar non-relationship between presidential vote and House national vote. 1. In none of the 20 previous House elections did one party win a large share of the presidential vote and lose a large number of seats in the House. It would seem quite unlikely that President Obama could go down to defeat, while the Democrats win the 25 seats necessary to regain the House. 2. 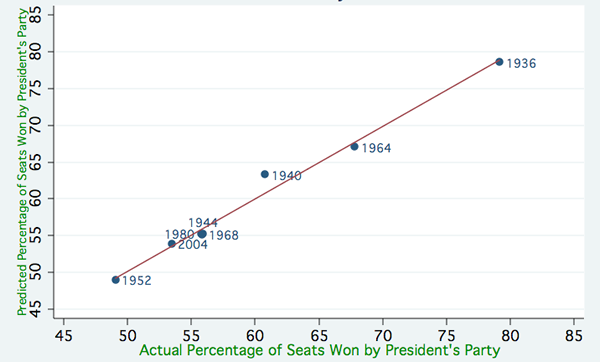 In the 10 elections since 1952 in which the president’s party did not control the House, the largest seat gain for either party has been 21. It would seem that in the past 60 years voters have been unwilling to reward or blame either party too greatly when faced with split government. They tend to like the status quo. When we combine these two facts with President Obama’s low approval ratings, history tells us that the Republicans appear to be in a very good position to keep control of the House. *All percentages are based off two-party share. That is, 100 * President’s Party Percentage / (President’s Party Percentage + Opposition Party’s Percentage). Harry Enten, a recent graduate of Dartmouth College, has previously interned at the NBC Political Unit in Washington D.C. and Pollster.com.